It's nice to believe we are all unique, in some way, right? Well, we're not. Or rather, what people around the globe eat is not, and is becoming less so as agricultural production systems homogenize. According to new research by the International Centre for Tropical Agriculture (CIAT), "it's official". Diets are converging around a select few foods, because agricultural production around the world is shifting to the same particular set of crops. 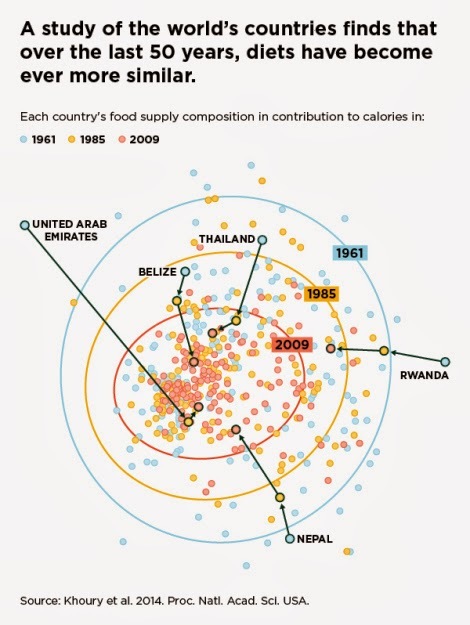 The galaxy of diets converging. Is this how systems die? While I don't find this particularly surprising, there is one element that piqued my interest. From the perspective of someone who studies biodiversity, this seems to be a case of comparing alpha (within system) and beta (between systems) diversity. Plain speak? Apparently, individual countries now have more pages in their menus. The dominance of one food staple is becoming less common. Cool, so I can live in the US and eat my mango, too! But, if we examine how the range of crops produced varies from country to country, it's evident that the composition of what we are consuming is trending toward similarity. And these follow the base of Standard Western Diets (or Standard American Diet - SAD - because it has a better acronym) and primarily consist of ingredients for processing (e.g. oils, wheat, rice, etc.). I mean, this makes sense; these are also the crops for which money has gone into varietal improvements, technology development, and industrialisation. The paper does point out a couple of drawbacks with the loss of global diversity. For one, SAD is quite depressing, as it is linked with many diseases of afluency - namely obesity, heart disease, and diabetes. Many of these ailments are receiving recognition as global concerns. On the more agronomic side of things, decreased overall diversity is worrisome for the potential future implications. Having agrobiodiversity and a suite of plant genetic resources from which to pull traits and adapt to shifts in condition is considered pretty central to adaptation discussions. And we are undermining our very ability to cope with very likely climatic and other biotic changes. Time Magazine, of course, pulls out the banana example as to why this homogenization is a problem, and the dangers from pests and diseases wiping out our ability to feed a planet-ful of people. I will leave you on that note to chew on for a bit. Really interesting study. Will the results be compelling enough to spur change? I'm sold!